Quick Size, also known as Fast Size, is an oil-base adhesive / glue that takes about 1 hour to reach proper tack (or set), depending on temperature and humidity. Once tack is reached, there is about one hour where gold, silver, or other metallic leaf, can be gilded. IMPORTANT: Always apply the size thin thin thin. 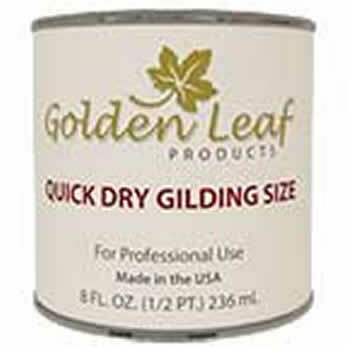 Some gilders apply it and then immediately use a foam roller to remove most of what was just applied. It needs to be thin. For additional information, please click here. For coverage information, please click here. For a longer application window, consider using Slow Size, for 10-12 hour tack (or set) time, and 10-12 hour application time. You can also mix half Slow Size and half Quick Size for a 3 hour tack (or set) time and 3 hour application time. Quick Size is flammable and must be shipped by ground services.